Home » Events » 2018 Cohasset Triathlon! 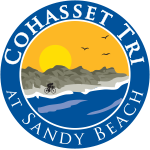 Come to the 2018 Cohasset Triathlon on Sunday, June 24th! The race starts at 7:45 am at Sandy Beach. There will also be live music on the Big Stage all morning! The River Roadies will be there handing out prizes and giving away an assortment of different concert tickets throughout the day! It’s going to be a fun day and we hope to see you there!